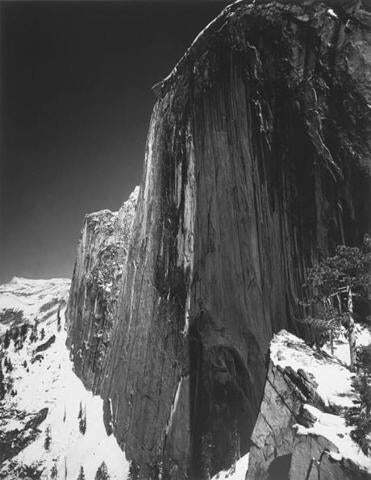 “Monolith — The Face of Half Dome, Yosemite National Park” by Ansel Adams. When you hear “Ansel Adams,” what do you see? Wait. Don’t answer. We know. It’s the very same thing so many of us do: That shimmering image of Half Dome, an imposing mound of granite looming 5,000 feet above the forest floor of Yosemite National Park, its silvery hide carved in stark contrast to the near-black sky beyond. It’s a picture made eternal as much by Adams’s lens as by its presence on dorm-room walls, calendars, and screensavers from one corner of the continent to the other (I couldn’t find any hard numbers, but as someone who had it on his own dorm wall in tiny London, Canada, I can provide anecdotal evidence: Almost half the rooms along my hallway had it, too). A picture so embedded in the popular consciousness is a lovely thing for any artist to achieve, but when it proves to be a barrier to the breadth of his work, that’s a problem. When that’s all you see when you think of Adams, there’s a willful myopia that needs to be remedied. 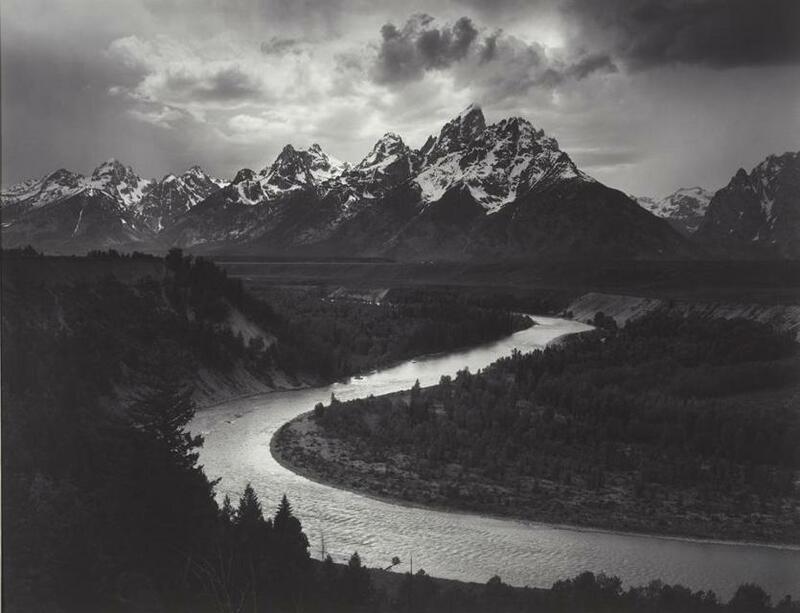 That’s surely the point of “Ansel Adams in Our Time,” the Museum of Fine Arts’s sprawling, nearly 200-piece exhibition, which opens Thursday. 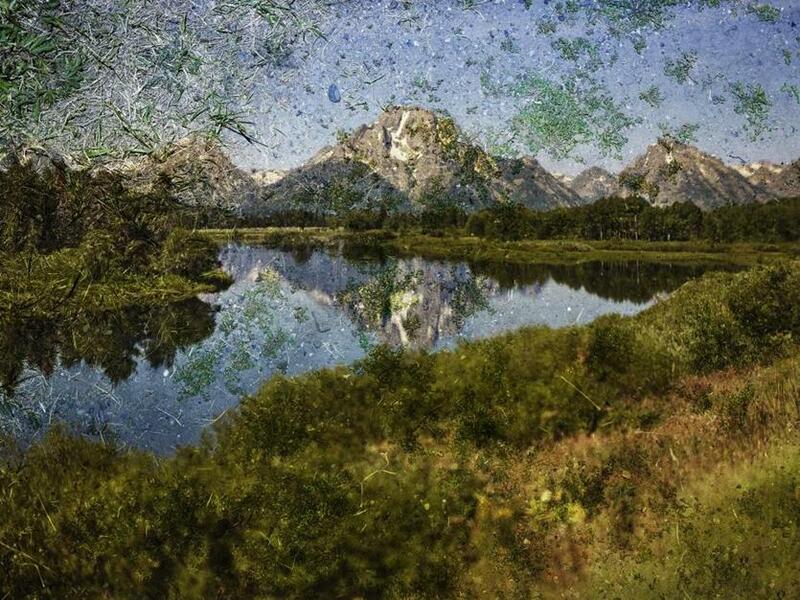 The iconic landscape photographer’s reputation as a purveyor of idealized wilderness is well-earned, but this show teases out contemporary alliances for a figure more complex than his popular image allows. Worry not, ye faithful: “Monolith,” that iconic image of Half Dome that Adams shot in 1927 while precariously perched on the aptly named Diving Board, a shelf of granite hanging over the valley floor, is right here to greet you (printed in 1962 in all its sterling majesty, Haas points out, at the height of Adams’s enterprising commercialism). “Monolith,” though, is not alone. Nearby, a cobbled-together panorama of that very same valley by Mark Klett and Byron Wolfe plasters Adams’s view into its pastiche, along with another from the pioneering 19th-century photographer Carleton Watkins. It sets a course for the entire exhibition to follow: All protestations of inviolate naturalism aside, photography has always presented a constructed view. This is neither a show of sacrilege nor of reverence, but one that situates Adams in the broader swim of his medium — both what came before and what happened next. Watkins, a New Yorker who pushed west, drawn by the California gold rush in 1849, became an important figure for Adams to follow, but also push back against: In a standout moment, Adams’s picture of an unspoiled Yosemite Valley sits right next to Watkins’s near-identical frame. Decades before, it looked pretty spoiled. A logging road carves its way along the valley floor — a road, in the picture right next to it, Adams has taken pains to re-touch away. Haas sprinkles moments like these throughout the exhibition like bread crumbs, leading you from one counterintuitive moment to the next. 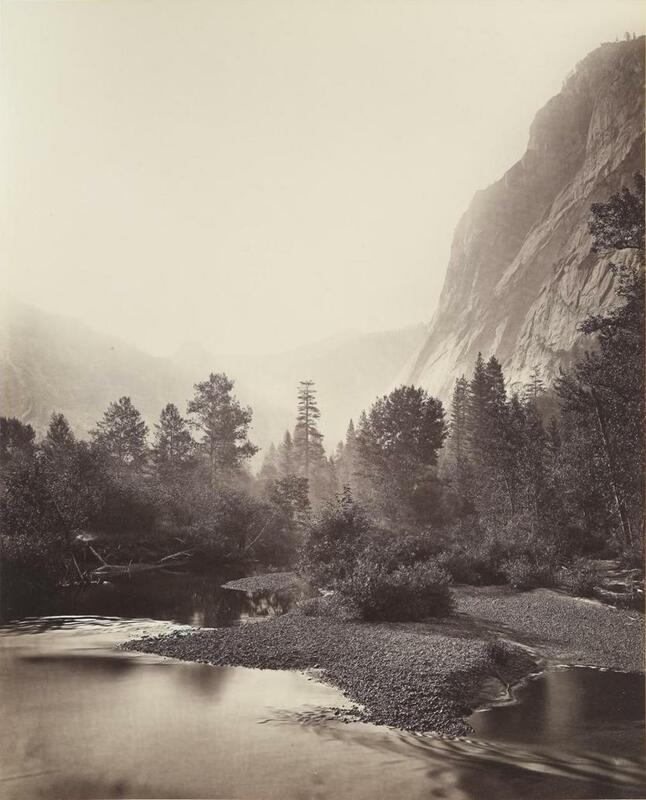 At the height of the Civil War, Watkins’s pictures provided the clincher for President Lincoln to designate the Yosemite Valley as the country’s first national park. By the 1920s, when Adams began his first forays into the park with photography in mind, it was a well-traveled tourist destination and not all the mythic, remote wilderness his pictures of that time suggest. One endearing element of the show is how bald-facedly it dismantles that myth: Some of Adams’s most iconic images of Yosemite were taken from the parking lot, which the show puts up front with a huge wall-size picture of Adams perched on the roof of his car with his large-format camera. The exhibition lives in such counterpoints, which deepen with each step further in. A grid of Adams’s early photos of Yosemite — pristine, immaculate, the photographer experimenting with darkroom techniques that would become his hallmark — is offset with a same-size network of pictures by the contemporary photographer Mark Ruwedel. Where Adams’s nature is untouched, Ruwedel’s is disturbed but abandoned — lonely western byways, roads or rail tracks, overgrown with brush or swallowed by desert. In later work, Adams inflects his blindered-seeming naturalism with a blunt awareness of the dark complexities of the contemporary world. Nothing, sadly, makes an Adams show more urgently topical than looming environmental catastrophe, and with recent news that carbon emissions were set to spike by an unexpectedly large 2.7 percent for 2018, not to mention President Trump’s intention to open 9 million acres of Alaskan wilderness preserve to oil drilling, the MFA couldn’t have hoped for better timing — or worse. But Adams himself was no Pollyanna with his nose buried in the forest. Mass industrialization was in full swing when he first picked up a camera; railroads and highways were established transportation arteries. Whatever our enduring notion of him, he waded gamely into political waters (he survived the great San Francisco earthquake of 1906, emerging with only a broken nose that, he later joked, permanently skewed him toward the left.) A small space here touches on his engagement with Native American culture, bent most often by photographers of his day toward exploitive exoticization (to leave no doubt, Haas includes here a set of pictures of Native Americans, printed on playing cards by Adam Clark Vroman in 1894). Adams, while working on a book on the Pueblo Native American tribes with the author Mary Hunter Austin, made several loose, portrait-like images of the people he met there; they’re rare examples of Adams working with human subjects, whom he captures with deferential respect. More in his milieu, and a canny companion to the content in this space, is the kind of image of typically anodyne beauty we associate most with Adams, of an ancient, long-abandoned Native American village in New Mexico. It’s haunting, in the photographer’s ghostly silver-grays; but Haas has paired it with a near-identical frame taken by Timothy H. O’Sullivan and freighted it with different meaning. O’Sullivan’s picture, from 1873, was commissioned as part of a surveyors’ project to determine which lands to expropriate from Native Americans. These gestures insinuate themselves subtly throughout, though they grow bolder gallery to gallery. The main event, a large space where Adams’s commissioned pictures for the national parks share space with an array of contemporary artists, is where the old master takes the most hits: from Catherine Opie, whose glorious, soft-focus color images of mountains and waterfalls seem a direct subversion of the macho outdoorsman’s pursuit of crisp images in robust black and white; or from Newton-based artist Abelardo Morell, whose roughly-textured pictures merge a heroic Adams-esque view with the trampled grass and tourist detritus that lay beneath his feet. Don’t believe him, they seem to say, and Haas lets him take his lumps: The Adams pictures in this space are all smaller scale, not the huge, heroic prints you might expect. But past the parks, the show allies Adams with surprising confreres: Trevor Paglen, whose stark fogs of color reveal tiny surveillance tools — a drone here, a satellite there — or Stephen Tourlentes, whose landscapes are barren, desolate things, but for the dull glow of a maximum security prison in the wedge of two mountains. Here, landscape isn’t heroic. It’s menacing, and Adams finds his place. 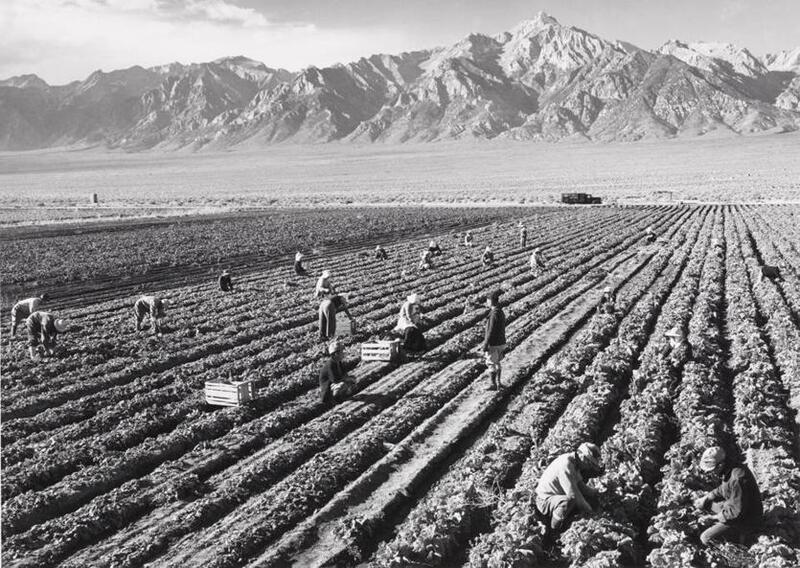 On an excursion in the 1940s to photograph Mount Williamson in the Sierra Nevada range, he discovered the Manzanar Japanese internment camps, to which he gained access and committed to documenting. 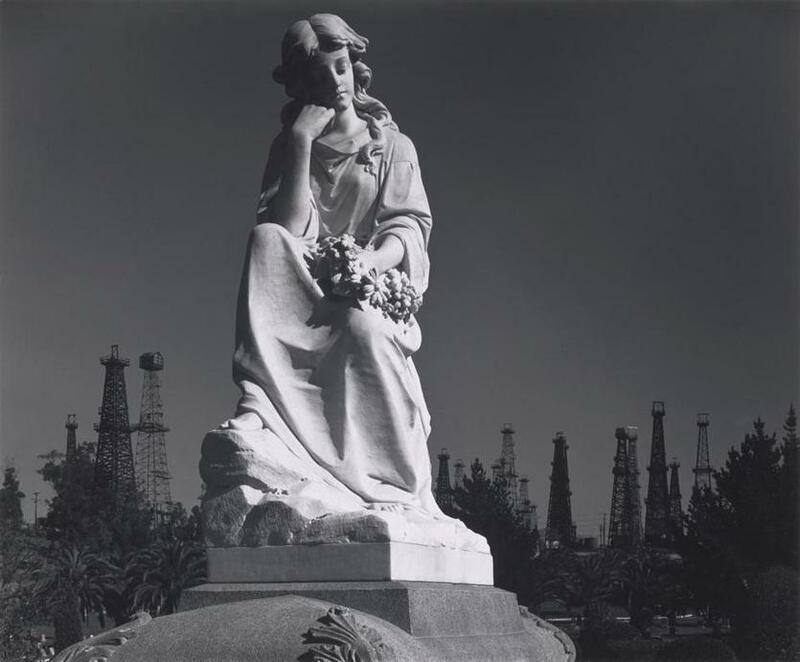 The remaining work here is the least Adams-esque I’ve seen: One image, of a neoclassical angel statue surrounded by oil derricks, is pure high-modern black humor. Pictures of ghost towns and old men, rocking away on dilapidated porches, made me think of James Agee; images of snaking highway overpasses or chaotic housing developments, Stephen Shore. We are jarred here not just with an unseen Adams, but with young photographers his work has inspired. In one huge picture, a giant back-hoe loader carves into the sand, waves breaking on its metal track as it tries to repair eroding beach along the California shore. It’s a picture by Lucas Foglia, a young photographer triggered by Adams’s mesmerizing “Surf Sequence,” an aerial view of black waves ceding to silver sand and iridescent foam along an untouched coast. At first glance, it might seem critical, like Opie’s or Morell’s, but I’m not so sure. They represent a shared hope — of damage undone, a place to return to. That’s the Ansel Adams our time needs to look to, and with clear eyes.